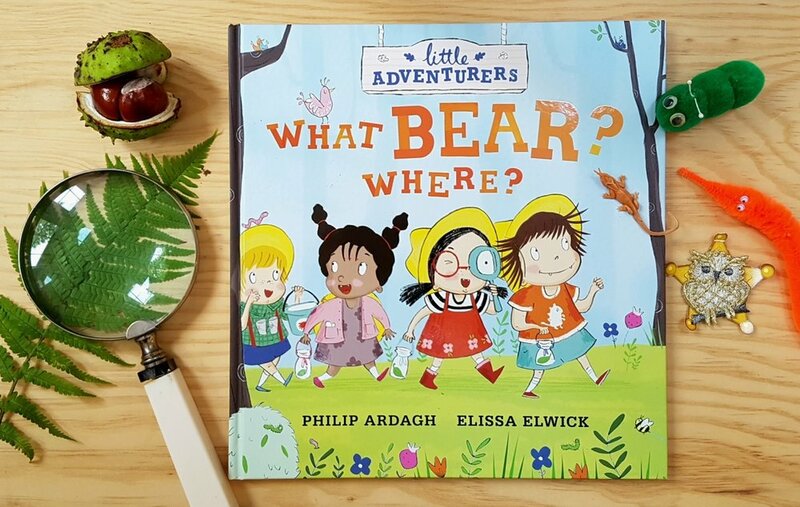 There’s a lot of excitement here at Ardagh & Elwick HQ because the second of our Little Adventurers’ little adventures is out today! Called WHAT BEAR? WHERE?, this latest story finds Finnegan, Floss, Peanut and Sprat hunting around the garden for all types of animals… but they keep coming face to face with things that are not QUITE what they seem. Elissa (that’s Elwick) and I (who must be Ardagh) had SO much fun coming up with this one. We’ve really got to know the Little Adventurers and how each would react in just about any situation, from how they’d look, to what they’d say. There aren’t all the Little Adventurer’s pets that appear in LEAFY in this one – except, of course, Peanut has her pet mouse Pocket in her pocket – but there are plenty of other animals to entertain them, from creepy-crawlies to a bear. Not a bear, surely? In a garden? What bear? Where? In advance of today’s publication, we had a special WHAT BEAR? WHERE? launch at the Edinburgh International Book Festival, where EVERYONE got in on the act. Here’s Roland Gulliver, associate director of the festival, clutching his copy of WHAT BEAR? WHERE? in the author yurt ( a special kind of tent, which is for illustrators too). And here’s Janet Smyth, Children’s programmer, photobombing a LOVELY photo of us. What a cheek! And, finally, here we are enjoying some fancy fruit-mocktails in celebration of a fun-packed family event with props and puppets, which ended in our signing our first copies of this new little adventure. I’m the one on the left. I mean RIGHT. I’m the one on the right. The one on the left is Elwick… I think. To encourage you to be on the look-out for WHAT BEAR? WHERE? in your local bookshop, library or online, here’s Elwick looking through a pair of VERY expensive binoculars… Hard to believe, I know, but I can exclusively reveal – between you and me – that she actually *lowers voice* made them herself. And what are we working on now? The NEXT little adventure of course. And, this time, the awesome foursome are heading off to the beach. In the meantime, from me and Elwick, it’s bye for now! ARDAGH: We’ve been very BAD, haven’t we, Elwick? ARDAGH: …since we last wrote anything. 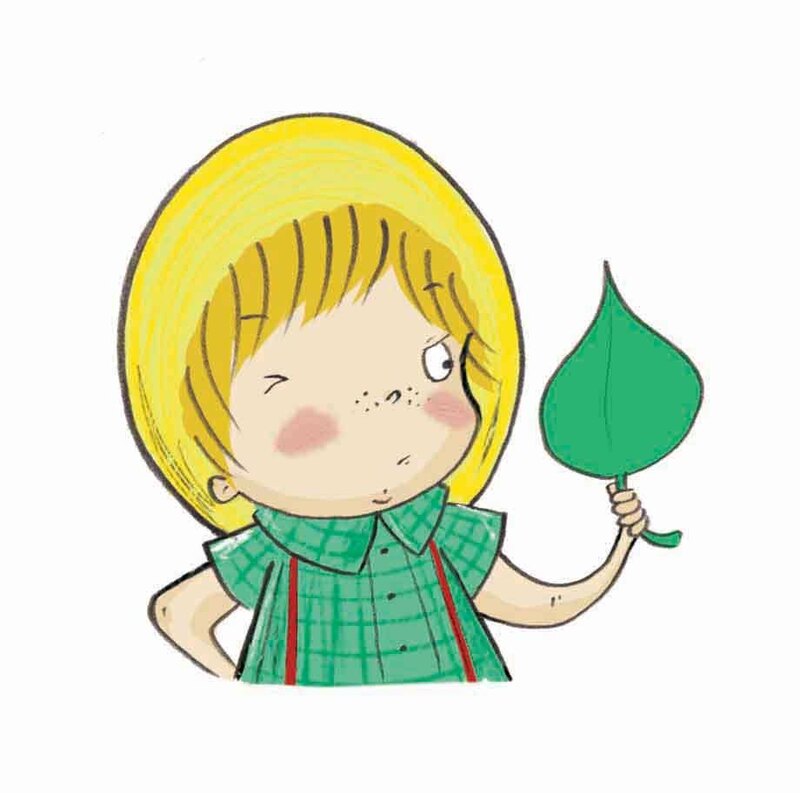 But that’s because we’ve been INCREDIBLY busy working on LEAFY THE PET LEAF and drum roll, please… DRUM ROLL PLEASE. ELWICK Oh yes it is! ELWICK: Why was I the one who had to do the ‘oh-yes- it-is’ line? ARDAGH: Can we get on, Elwick? ELWICK: And my sketches. Don’t forget them! ELWICK: What? Rather than pretending? ELWICK: And they’re very NICE words, Ardagh. ARDAGH: They are, Elwick… we thought we’d let you see some of the illustrations in FULL COLOUR along with some photos of us hard at work in the Walker office, and a couple of silly videos. ELWICK: And do you think we should show them those videos, Ardagh? ELWICK: Are you SURE, Ardagh? ELWICK: Don’t say I didn’t warn you. ELWICK: You’re very a wise man, sometimes, Ardagh. Biscuit? Sometimes writing comes easy. I – Ardagh of Ardagh & Elwick– sit at my desk and words spill out via my fingers on the keyboard onto the screen, or via my pen onto the page. They splurge onto the the paper. Spring eagerly onto the screen. Sometimes it’s hard to keep up the speed of my writing or typing with the speed at which the words form in my mind. This applies to stories, e-mails, notes and blogs. Everything. Sometimes a blog entry pretty much writes itself. Sometimes, the words are more reluctant to come out, like the very last piece of toothpaste in the tube, or a cat out of a catbasket at the vet’s. I wonder if it’s the same with Elissa – that’s Elwick to you – and her drawing? I would ask her but she’s currently busy leaping around the studio taking arty photos for this latest blog. She didn’t take this photo of us at walker HQ. Or this one of us waiting at a bus stop. Oooo! 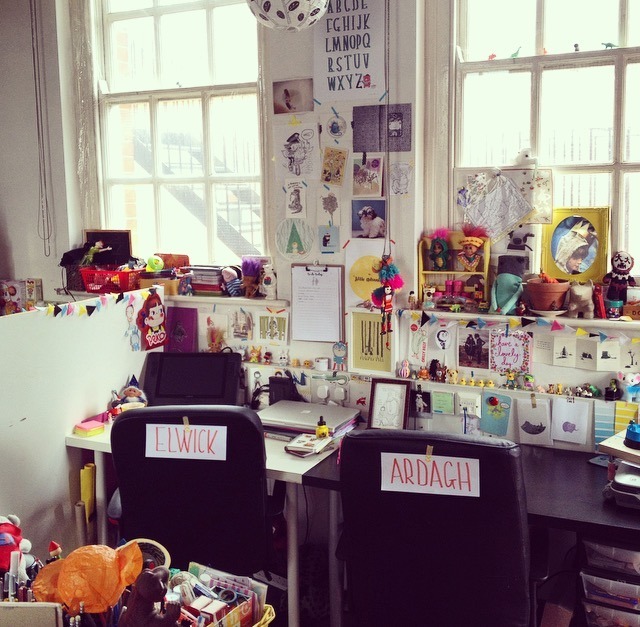 But she did take these photos of her pencil layouts and colour work for the first Little Adventurers’ little adventure. But she’s MESSING WITH OUR MINDS, showing you only little snippets. They’re good though, aren’t they? That’s an upside-down Peanut, I reckon. But is that Finnegan or Sprat? Hmmm… And I’m LOVING that bee. Which reminds me, we should get busy. This book won’t make itself. Isn’t that right, Walker Books publisher person, Deirdre? Write! Write! Write! Draw! Draw! Draw! PS. Even on the hard days, we still have the best jobs in the world. Isn’t that right, Elissa… Elissa? What’s she doing now? This weeks blog post is a Q&A with Ardagh and Elwick, where Ardagh asks Elwick and Elwick asks Ardagh. So here’s my (Ardagh’s) first question to Elissa (Elwick). 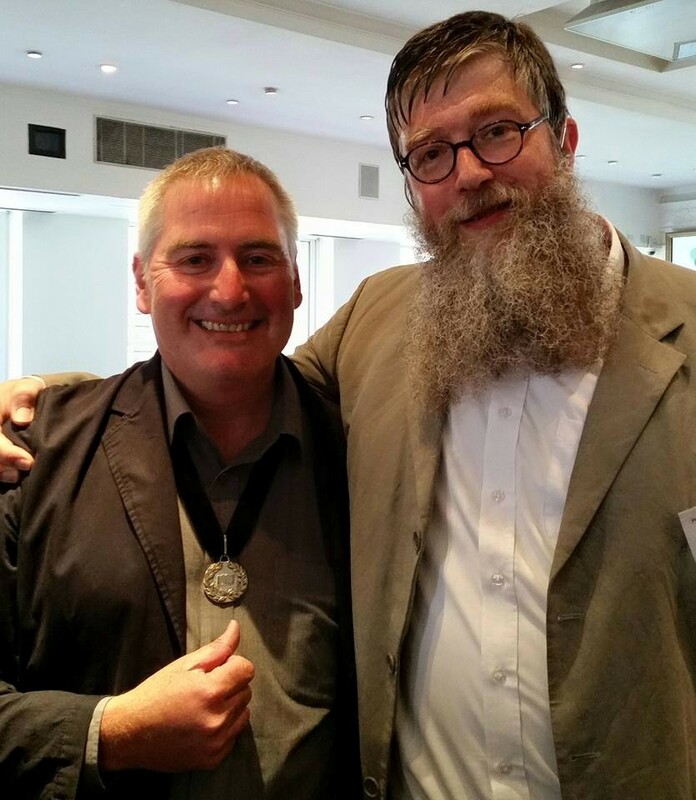 ARDAGH: What’s it like working with one of the greatest writers of his generation? ELWICK: How should I know? ARDAGH: I was referring to me. ELWICK: You mean you were asking yourself that question? ARDAGH: No, I was asking what it’s like to work with me. ELWICK: It’s rather fun, isn’t it? There’s always a mixture of silliness and hard work, and I like that we often challenge each others ideas and evolve things into a big bundle of Ardagh&Elwick-ness. There is only one down side to working directly next to you though, and that’s your humming, but I’m learning to drown that out with cheesy film soundtracks, so we’re all good. ARDAGH: What’s the best thing about our partnership? ELWICK: Organic process, really is a collaborative process. ARDAGH: Now it’s your turn to ask me a question. ELWICK: Okay. Which was your favourite Ninja Turtle? I liked the one who ate all the pizza. ARDAGH: I was grown up and married when Ninja Turtles came along. I’ve never even seen an episode, you CHILD. Now ask me a proper question. ELWICK: What’s your favourite thing out of ALL the best things about working with me? ARDAGH: Well I must admit that I love the lunches you make for me when I come up to London to your studio. I like the way you always wear fancy dress…It is fancy dress isn’t it? I love the way you give your drawings such character and bring them to life. And I’ve been a particular fan of the way you draw trees…But most of all I like the way your mind works and how similarly we think but at the same time together we come up with something that neither of us would have come up with on our own. ARDAGH: How do you plan to make the look of Little Adventurers stand out from other picture books? ELWICK: I don’t want the artwork to look too flat and digital, especially since the series itself has a very make and do/handmade quality to it, so I’m going to incorporate different textures, pencil/charcoal, etc, alongside my digital way of working. With us both working so closely with Jack [our designer at Walker books] we’re thinking about the book as a whole, how the narrative is conveyed through the images and not just spread by spread. Every detail is being thought about carefully. ARDAGH: So, in combination with the text we’ve also worked on so closely together, this should be a mighty fine first book. One last question for me? ELWICK: How has the process of writing a picture book differed from your usual fiction? ARDAGH: I don’t think it’s really a matter of the difference between writing a full length children’s novel and a picture book, it’s the difference between sitting along in a room in front of a computer for months on end, and collaborating with someone else who also brings so much to the table. That’s a compliment because I’m referring to YOU, Elwick. ARDAGH: Shall we end on a high then? ELWICK: We could show a video of our working process. 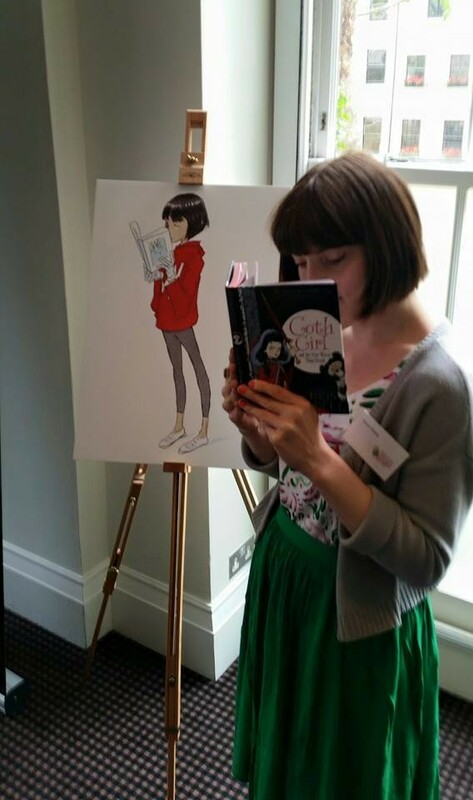 Last week was the Walker Books conference. It probably had a grander title than that but, whatever it was actually called, it was a chance for Ardagh & Elwick and the Little Adventurers to be introduced to the whole company. The task of bigging up Finnegan, Floss, Peanut and Sprat was down to editor Maria Tunney, who then invited me (Philip) up on stage to talk about… Well, to talk about ME. Because about the first thing people notice about me after my height – I’m 6ft 7in (2 metres) tall – is usually my big, bushy beard, I thought I’d show where I got it from. No, not from BEARDS ‘R’ US but passed down from my mother’s side of the family. So I showed a photo taken in India in 1868, which included my great-great grandfather sporting the beard. The woman next to him, holding her hat over her tummy, is my great-great grandmother. And growing inside that tummy is my great grandmother who was born later that same year. And she was still alive when I was born. I’m not sure what it proves, but it’s always nice to get out the family album. Elissa soon joined me on stage to steer things away from maternal ancestral facial hair and back to Little Adventurers. I set the ball rolling with some tricky quick-fire tasks. ARDAGH: Name the Little Adventurers in alphabetical order. ELWICK: Finnegan, Floss, Peanut and Sprat. ARDAGH: Name the Little Adventurers in order of height. ARDAGH: Name the Little Adventurers in order of age. Do you see a pattern developing there? So the NEXT time Ardagh & Elwick are in the Walker Books offices just about everyone should know what we’re playing at. Did I say playing at? I meant WORKING VERY HARD ON. One of the nice things about being half of Ardagh & Elwick is being half of Ardagh and Elwick. People now recognize us as a double-act, like Huntley & Palmer, Gilbert & George or Abbot & Costello. Well, not actually like any of those people but you get the picture. When I – Philip – am out and about people ask me about Elissa. “Does she really skateboard around the studio?” And when I – Elissa – am out and about, people ask me about Philip. “What’s he like to work with? Does he really get beard hairs everywhere?” And then they ask about our work – about Little Adventurers – in a way that no one seems to ask us about or solo projects. And, unlike Ant & Dec, people rarely get confused as to which of us is which. Although I – the Ardagh of Ardagh and Elwick – have been staying in a castle in Ireland for a story festival leaving behind the Elwick – of Ardagh and Elwick – hard at work on various projects back at her studio, the Little Adventurers have never been far from my mind. Before the Little Adventurers found their home at Walker Books, Elissa and I worked on the project in cafes and bars wherever and whenever. Then, once embraced by the Walker team of Deirdre, Maria, Jack, we even worked out of an office at Walker HQ for while. Now, we regularly meet at Elissa’s studio. But, in between times, I’m forever scribbling in notebooks or tapping away on my laptop. So, whether it’s Ireland, Dubai or buying beard-combs in Bexhill, I still have Finnegan, Floss, Peanut and Sprat scuttling around in my head, having lots of tiny little adventures and chattering away to each other. And dialogue plays an important part in the text. With Elissa’s illustrations doing so much of the work (once we’ve discussed at great length between us what will go into them), one of the most important things the words can do is make the Little Adventurers speak, advancing the plot but, equally importantly, revealing their personality. Then I write the text. We pour over it. Laugh. Flag up the good bits. Argue over the not-so-obviously good bits, reshape it and Elissa does some pencil roughs. It’s been interesting finding my ‘voice’ for a younger readership. Or should that be a younger being-read-to-ship? People who know me, say that my books read like my talking. People who meet me having read my books say that I sound like them. So how to tackle stories for much younger children. What of my ‘voice’ then? Fortunately, I have a strong streak of childlike wonder and innocence running through me which I feel I’ve managed to tap into the latest draft of Book One. The good news is that Elissa has been reading through it as I write this, and she’s been making all the right noises – ‘Oooo!’s ‘Ahhh!’s and chuckles – in all the right places. It’s MY turn to write today…I’ve fed Ardagh some lunch and he’s got himself comfy in a corner of the studio, pretending to do some work. Although we’re both very involved in what the Little Adventurers are up to on each page - the whole look of the book - it’s me who does all the actual drawing (though I do find Philip’s little animal doodles rather endearing). At the very beginning, I had a Little Adventurer called Finnigan, as a central character of a story I’d come up with but I felt he needed friends and funnifying. Then I teamed up with Philip (who I’d been working with on other ideas yet to be unleashed upon the world) and together we created Floss, Sprat and, lastly, Peanut. They came wandering out of our imaginations and onto the page almost fully formed, though each took a bit of getting to know - their likes, dislikes, even what pet they have - but that’s been part of the fun about working on a series like this, and especially as part of a collaborative team - combining our ideas about what a particular character might or might not do, really fleshing them out until they feel almost real to us. Part of the satisfaction of getting to know each Little Adventurer so well is that we know how they’re going to react in any given situation…though that’s not to say they haven’t sometimes surprised us. Some of the characterisation came out of my early sketches. We talked, I sketched. We talked some more I sketched some more. Once I’m done with a pencil sketch I usually take it onto the light box and create the final lines with a VERY sharp pencil, or sometimes - like in this instance - I scan them into my computer and do the final lines and colour them up on my Wacom Cintiq. It’ll be interesting to see, once the first book is published, how similar or different they look to our earliest ideas. Our first post since the day we went public. I have it on good authority that there was a real buzz at Bologna when the Little Adventurers were announced. I’m not exactly sure what that means, but I doubt it has anything to do with wasps in jars and is probably more about the EXCITEMENT it generated. Elissa and I haven’t actually had much opportunity to get our teeth back into the project - or mix our metaphors - because of the Easter break (when, for legal reasons, I am required to eat my body weight in chocolate eggs). …but we’re ready to get Little Adventuring. In our next post we’ll be talking a bit about how we actually work together. 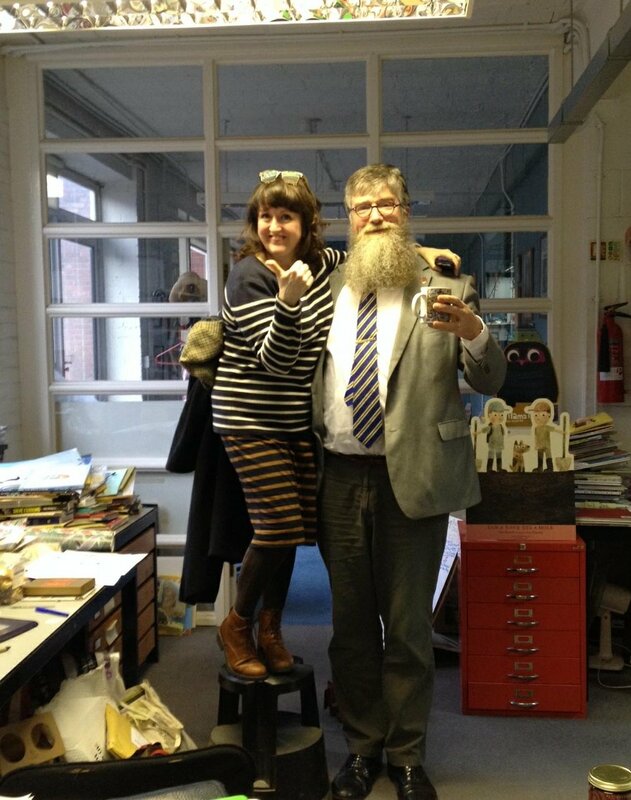 After months of silence, we can now reveal that we – Philip Ardagh and Elissa Elwick – are a picture book duo, with a four book deal with the wonderful Walker Books. We’ve been itching to tell people for a long time, and photographs of us (along with Sarah McIntyre) enjoying lunches at the Fleece Station studio have hinted that something was afoot. The series, called Little Adventurers, is being nurtured at Walker by Deirdre McDermott, Maria Tunney and Jack Noel, and we couldn’t have hoped for a happier home. This really is a collaborative process with Philip wading in with picture ideas and Elissa crossing out whole paragraphs of substandard text. Excited just doesn’t describe it.